Please welcome Niseido’s newest Sensei, Rick Schultz! As I watched this test in Louisville this past weekend, I thought to myself that he not only brought honor to the Louisville Dojo, he brought honor to the art of Niseido JuJitsu. He will be an asset to the Louisville DoJo for many years to come. 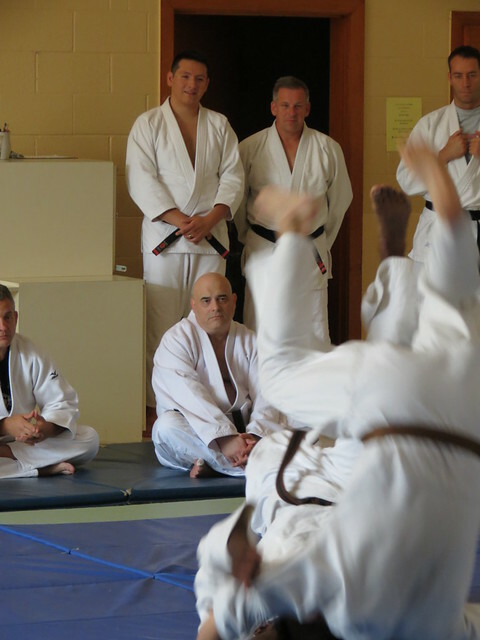 Kudo’s to Sensei Jim Mahanes as well as all the students of the Louisville Dojo for their roll in getting Sensei Rick Schultz over the threshold to Black Belt. He is the first of many black belts to come from The Louisville Dojo. Yama Arashi looked so inviting that I had to jump in and deliver a few. We had our first class Saturday morning at the Golden Gate Community Center. The new location looks like it will serve our needs very well. We are looking forward to the future of Niseido JuJitsu here in Naples. Danny plowed through his test and towards the end really dug deep down for what was necessary to finish. Danny is one strong guy as all of his uki’s can vouch for this morning. The support for Danny’s test was absolutely amazing as we watched everyone from the east coast pile through the front door. We want to take a moment to recognize and thank those who took the time from their busy schedules to make the 2 ½ hour trip over. In attendance were Professor Rick Riccardi, Professor Tom Holste, Sensei Robert Pichardo, Sensei Ike Anderson, Sensei Randy Smith, Sensei Robert Thompson, Sensei Andrei Itkis, Sensei Shawn Thompson, Sempai Brandon Smith, Yonkyu Evan Thomas as well as Sensei Robert and Shawn’s parents who attend almost every test no matter where they are. The students at FKC could not believe the level of support from all the Niseido practitioners. We also want to take a moment to thank Shihon Jack and Renshi Pam Morris for having the test at the Florida Karate Center and for opening their doors for our club. It is a bittersweet time for all of us as they close their doors and open the next chapter of their lives. Last night we had a visitor from the Louisville Dojo drop in and train with us. Josh Harmon took a short break from his long awaited vacation with his family to put some time on the mats. We were so glad he came as it always gives everyone an opportunity to exchange tips and techniques. We took advantage of the visit and put an extra hour and a half on the mats. Many thanks to Josh for stopping in as well as to Sensei Jim Mahanes for his great leadership in Louisville. It really showed in Josh. There’s an old statement that Shihon Jack Morris drilled into me over the years. “No one makes it to Black Belt alone”. Tuesday night was a great example of that! Here you have Josh on vacation with his family taking time to work out at our club. By the same token you have Brandon and Danny who are preparing for their Nikyu and Sankyu tests that proved to be great Uki’s for Josh. All in all it was a great night. A special thank you to Shihon jack and Renshi Pam Morris for opening their doors to us at The Florida Karate Center. BTW… I love the new purple color in the belt, I ordered one for Danny! These are most of my video clips taken from my IPhone on Shawn Thompsons Black Belt Test from Saturday October 11 2014. There are 36 minutes of highlights from the 3 plus hour test so you can fast forward to the combative’s if you want although all the techniques are great. I had the honor and pleasure to be on the grading board for Shawn’s test this past weekend. Over 20 Niseido Black Belts from around the country made the trip to Boca Raton to watch and grade his grueling 3 hour test. As if that wasn’t exciting enough we were also able to witness Professor Tom Holste’s promotion to 7th degree Black Belt as well. A well deserved promotion!! Shawn, at the age of 19, did a tremendous job plowing through each and every opponent on his test. I’m guessing they are all on Advil today! These segments prove that Karate practitioners with no JuJitsu training are white belts on the ground. By the same token any JuJitsu practitioner with no Karate training are white belts with stand up. You need both….. And Shawn’s test proved how well the combination works. I had the privilege to be on the grading board for Roberts test on Saturday. The grading board had to dig pretty deep to find things to rattle his cage with. He had great stamina, strength, focus and speed blasting through the 2 1/2 hour grueling exam. This combined clips run about 45 minutes of the almost 2 1/2 hour test he took so you can just imagine! This test came after Roberts amazing physical comeback from a very serious health problem that he overcame as he was getting prepared for this. This was sent to me earlier today. Copyright © 2019 Naples Niseido Ju Jitsu. All Rights Reserved.